When we started Nicholson Auto as a family-owned business in 1973, we set out to provide something a little different from the competition, something a bit more meaningful. After all, a towing job can be executed perfectly but still be unpleasant if not performed with a sense of urgency and respect. At Nicholson Auto, we understand this, and that’s why we guarantee not only a clean, damage-free tow, but also a friendly, personable one. There’s no reason you should have to deal with unpleasant or surly service after you’ve already been in an accident. Even if it’s a scheduled job and there’s been no accident, somebody’s still handling your equipment, and you want to be sure the company you call will treat you and your vehicle with the appropriate level of respect. We offer a 24-hour live dispatch, because car troubles rarely occur at convenient moments, and when you need us, we want to be there at a moment’s notice. We understand the value of making sure our clients feel comfortable throughout the entire process. We’ve handled all types of accident recovery and equipment transport jobs, watching technology evolve over the years and keeping up by growing alongside it. Our company is AAA-certified, and we have extensive experience working with State Farm insurance and local police departments. Great people work here at Nicholson's Auto Repair and Towing. I have had my vehicles towed by Nicholson's. 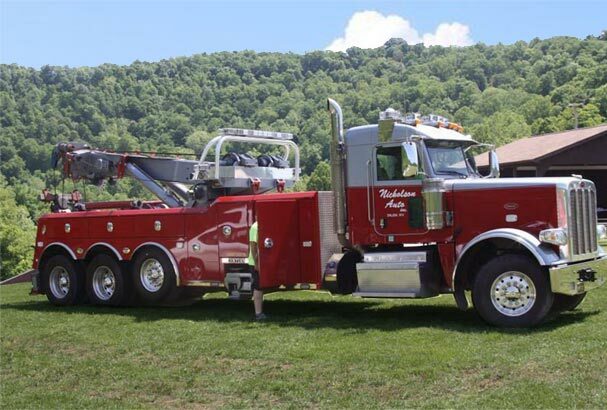 Their tow rates are reasonable, and they also do State Inspections.